Pancakes are hard to make. Everybody makes them, or has made them, and yet it’s taken me an awfully long time to perfect mine. Making a souffle was much easier by comparison. But even recreational weekend breakfast cooks (also known as “dads”) make these so they certainly have a reputation for being do-able (ok, no Lance Armstrong jokes, please, the man has enough problems.) Maybe it’s because they are typically served to small children who rarely send anything covered in syrup back to the kitchen. Like deep-frying, the secret, in my opinion, is heat control. There are as many good pancake recipes out there as there are Europeans twitchy about the Greek economy but none of them will work if you don’t know your stove and your pan or griddle. Too hot and they are scorched on the outside and liquid in the middle; too low and they are anemic and thin. Even if you keep the flame at the same level throughout the pan surface gets hotter and hotter which is why the first couple of flapjacks are never the same as the last ones. How did these damn things get so popular? 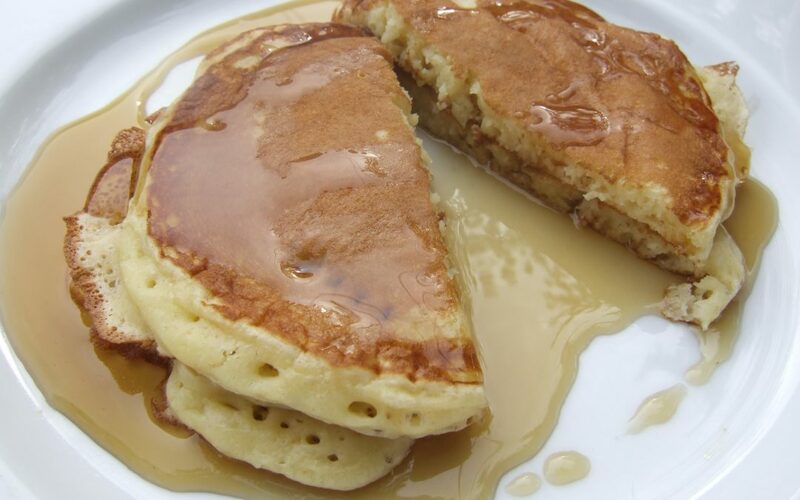 Gwyneth’s late father’s recipe very closely resembles my go-to pancake recipe from The America’s Test Kitchen Family Cookbook and, thus, produces outstanding pancakes if you can get your heat under control. But even Bruce took years to perfect this recipe, originally from The Joy of Cooking, so don’t get cocky. His includes an overnight rest in the fridge which I’m skeptical about but it certainly makes whipping these up in the morning easier so why not? This recipe also yields a lot of pancakes. Use it if you’re hosting a revival of Woodstock on your property and need breakfast for the hippies. Otherwise, make all the cakes and freeze the extras, as I do, with slips of parchment paper between them. You can then eat one or two later as needed. You can find the recipe here, courtesy of America’s favorite culinary punching bag, Rachel Ray. Kate, I agree….pancakes can be hard. If you haven’t tried Darcie’s recipe though you should. They are OUTSTANDING. I’m sure these are good too and will look through. I mix the dry ingredients for Darcie’s up and freeze.